There is a lot to cover heading into the final week of the Six nations championship with three sides still in contention. A hard-fought victory for Wales sees them maintain their lead at the top of the table but England looked excellent once again, hammering Italy at Twickenham. Ireland are still in contention but will be relying on the recently unreliable Scotsman to deliver a defeat to England in their own back garden. The first game of week four saw Wales head to Edinburgh to face Scotland who have faced stuttering form in recent years but remained confident due to a victory at home two years earlier against the Welshman. Unfortunately for them, Wales were able to scrape a victory despite Scotland having 75% possession during the second half, with 78% of the half being spent outside their own half. Wales performed well in the first-half, Josh Adams once again crossing the whitewash following an electric run along the wing. Wales scored a second through Jonathan Davies to make the score 6-15 before half-time and despite a Scottish resurgence in the second half, cutesy of a Darcy Graham try, Wales maintained their winning ways and kept Grand Slam Hopes Alive. The England performance is exactly what you would expect after watching them dominate against both Ireland and France compared to Italy’s 3 tough defeats. Although the Italians looked good against Scotland, Wales and Ireland, England were just far too clinical, fast and powerful for them causing them to concede 8 tries. Despite not having particularly high possession, England did phenomenally with what they had and are still in contention for the championship. They will be hoping that an Ireland side coming back into form will be able to defeat Wales in Cardiff so they can win the championship themselves. Speaking of Ireland, they saw a return to form against France following that serious defeat in the first game to England. Game-on-game, they appear to be improving and looking more and more like the side we saw playing in the Autumn, and a bonus point win will help in this recovery of form and confidence. France did put up a reasonable fight, scoring two tries of their own but with another loss they sit at 5th in the table, only above the Italians. 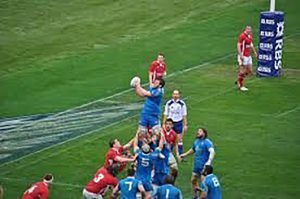 However, they will face Italy in Rome on Saturday and assuming, as I suspect most people will, and England Victory at Twickenham, they may be able to leapfrog Scotland into 4th and give Italy their 14th wooden spoon out of a possible 20.